Then Enerin sees a fearsome warrior who must be Storm Bull. -Go on without Storm Bull. 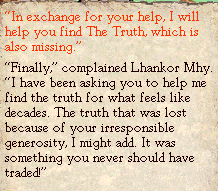 -"I have lost the truth, and must help Lhankor Mhy find it again." -"If you do not come, the trade routes will be confused forever." -"This way! There is chaos to fight!" -"You should not come with us, because Orlanth says you are needed here, to fight chaos." The legends aren't as useful here as knowing what Urox's schtick is, but I provide them anyway.